I’m excited to bring the latest Southern Cousins Mystery to you. It answers the question you’ve been asking for a long time: Will Jack and Callie’s baby be a girl or a boy? I’ve also thrown in some really big surprises that fans already love. “WOW!” is my favorite reader reaction so far. Elvis and the Devil in Disguise is available in both eBook format and paperback. You can get it at your favorite online bookstore. I’ve added buy links at the end of this post. 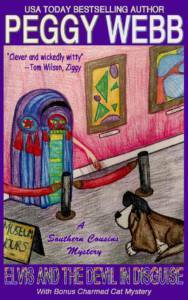 The Elvis cozy also contains a short story prequel to my new Charmed Cat Mystery series. I introduced the eccentric Delaney sisters and their magical cat Houdini in Elvis and the Devil in Disguise. I hope you enjoy them as much as I do. You’ll also get to read Chapter 1 of the first Charmed Cat book where you will meet the Delaney’s niece, Maggie Wild, an Olympic sharpshooter and the major protagonist for all the Charmed Cat Mysteries. There’s so much to tell about my new Elvis cozy that I hope I don’t confuse you…or myself, which is easier to do these days than I’d like to think. The other important fact you must know is that the paperback version of Elvis and the Devil in Disguise contains all the bonus material in the eBook version and also a full-length copy of my most recent Elvis cozy, Elvis and the Blue Suede Bones. Some of you prefer holding a real book in your hands and browsing your own bookshelves for the titles you love and want to read again. I get that. My own shelves are bulging with beloved favorites. The last time around (with Elvis) I got so swamped with other works in progress I didn’t create a paperback version. Thank you for waiting so patiently. Bones is in the back of the Devil paperback, so you might want to turn to the back and read it first. One more thing… As I wrote Elvis and the Devil in Disguise, Lovie knocked my socks off with a couple of plot twists I hadn’t planned. When she turned the story in a different direction, I followed along to see what would happen. And boy, did she deliver! Early readers LOVED it. So far, nobody has written spoilers. Yay! I hope you’ll grab your copy and join the fun. Thank you so much for reading my books. Please do leave reviews at the online bookstores, Goodreads and anywhere else you can think of. Your opinion matters so much to me and it also helps other readers find the Elvis series. Till next time, have a blessed day.